Background: Gastric cancer is one of the leading causes of cancer-related mortality worldwide. Genome-wide transcriptional profiling has provided valuable insights into the molecular basis underlying processes involved in gastric cancer initiation and progression. Objective: To understand the pathological and biological mechanisms of gastric cancer metastasis in a genome-wide context. Method: In this study, we constructed libraries from blood of gastric cancer patients with, and without, bone metastasis. High-throughput sequencing combined with differential expression analysis was used to investigate transcriptional changes. Results: We identified a total of 425 significantly differentially expressed genes. Protein-protein interaction network analysis suggested that most of these genes are involved in DNA replication, DNA damage response, collagen homeostasis and cell adhesion. Furthermore, our data suggested that NFkappaB and DNA damage response pathways were the key regulators of the bone metastasis associated with gastric cancer. Finally, most of these target genes were involved in pathways such as extracellular matrix organization and extracellular structure organization as revealed by gene set enrichment assay. Conclusion: Our study provides a comprehensive analysis of the transcriptional alterations involved in gastric cancer bone metastasis, which provides greater insights into the complexity of regulatory changes during tumorigenesis and offers novel diagnostic as well as therapeutic avenues. 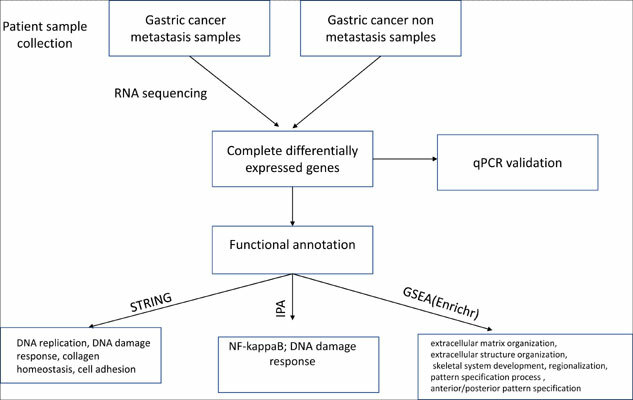 Gastric cancer, metastasis, transcriptome, RNA-seq, differential expression, genome wide.